Need LG WM0642W Front Load washing machine Reviews & Ratings? Recommended Buy. Everywhere you look; the LG WM0642H(W) front loading washing machine receives rave reviews from leading consumer publications and independent user reviews. This washer features many functions and traits found in higher end front loading washers, at a reasonable $899 list price. The LG WM0642H is Energy efficient, high capacity at 4.0 cubic feet and consistently cleans clothes well. To put its drum size into perspective, a 4.0 cu. 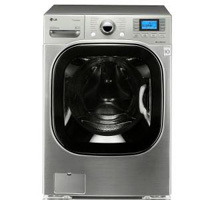 ft. unit can wash approximately 45 adult sized T-Shirts in one wash or handle a King Size comforter in one wash cycle. This washer doesn't offer a steam cycle, reserved for higher end (higher priced) units. This laundry machine is Energy Star rated and is rated at 135 kWh/yr, which is one of the most efficient we've come across, by a large margin. Not only will wash cycles cost less, but given the WM0642H's 1,200 RPM spin cycles, the unit removes a lot of moisture from clothes before hitting the dryer. The washers Direct Drive motor system increases washer longevity by replacing belts, commonly prone to failure. Cycle times tend to be above average at 95 minutes. #1) VERY Energy Efficient: Energy Star rated at 135 kWh/yr, this is one of the most efficient units we've come across without compromising capacity. Expect this machine to cost less per load than most others on the market, even at considerably higher price points. #2) High Spin Speeds: At 1,200 RPM this laundry machine removes a ton of moisture from clothes before it completes a given cycle. Less moisture in clothing means less dry time. Dryers are energy hogs, so less time means more money in your pocket. #3) Smart Design: Rotary dial selector knob has a solid feel in very intuitive to use. This simple design helps to reduce failures and makes using the LG WM0642HW washing machine a breeze. Small details like the 10 degree tilt tub make it easier to remove clothing from the rear of the drum. SenseClean system which adjusts wash cycles based on dirtiness of clothing. #4) High User and Expert Reviews: The LG WM0642HW reviews are some of the best in the industry. This washer has received high ratings from Consumer Reports, JD Powers, ConsumerSearch and Consumer Guide. Plus LG WM0642HW reviews given by users are consistently positive. #5) Reliable: LG Washing Machines are consistently viewed as some of the highest quality machines on the market. Backed by a solid 1 year warranty and a 10 year Direct Drive motor warranty, you're in good hands. #1) Long Cycle Time: No one wants to spend their whole weekend behind the washing machine. At 95 minutes, cycle times are long, but this shouldn't be an issue unless you doing many washes in a row. If you laundry demands are high and constant, you'll want to consider a higher capacity washer. #2) Vibration: Vibration levels on the WM0642HW were above average. Take this into consideration if planning to use this washer on the second floor. #3) Steam: This washer doesn't have a steam cycle. At its core this a solid washer and refreshing approach from some of the frivolous features packed into today's washing machines. Keep in mind that more features generally equate to a greater chance of failure. If you're going to replace an older washing machine due to energy inefficiencies and have a budget under $900, the LG WM0642HW is the way to go.